Anidori-Kiladra Talianna Isilee, Crown Princess of Kildenree, spends the first years of her life listening to her aunt's stories and learning the language of the birds, especially the swans. As she grows up Ani develops the skills of animal speech, but is never comfortable speaking with people, so when her silver-tongued lady in waiting leads a mutiny during Ani's journey to be married in a foreign land, Ani is helpless and cannot persuade anyone to help her. 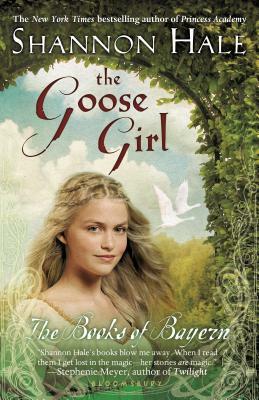 She becomes a goose girl and must use her own special, nearly magical powers to find her way to her true destiny. From the Grimm's fairy tale of the princess who became a goose girl before she could become queen, Shannon Hale has woven an incredible and original tale of a girl who must find her own unusual talents before she can lead the people she has made her own. "Enchanting. [Hale] adds such depth and scope.…In layer upon layer of detail a beautiful coming-of-age story emerges."